The amygdala is located in both hemispheres of the brain and is involved in a range of cognitive processes. The lateral amygdala receives input from visual, auditory, and somatosensory systems: the central nucleus is connected with the brainstem that controls innate behaviour and associated physiological responses, while the medial nucleus is connected with the olfactory system. Most of the pathways into the amygdala are excitatory, using glutamate as a transmitter. Information flow through the amygdala is modulated by a number of transmitters, including norepinephrine, serotonin, dopamine, and acetylcholine. The amygdala forms part of the limbic system. It is most commonly recognized as the emotional processing centre that receives incoming sensory information and processes it for an emotional response. The response may be a defence to a perceived threat, a critical function of this “early-warning system”. The amygdala learns how to respond to various stimuli based on its reference to implicit memory and makes decisions on how to initiate an emotional reaction to such stimuli. The emotional memory learned and utilized by the amygdala is episodic–autobiographical memory that can be notably implicit or unconscious, in contrast with explicit or declarative memory processed by the hippocampus. The left and right amygdalae have separate memory systems, but they work together to evaluate incoming information and process an emotional response, encoding, storing and retrieving memories that are associated with certain cues in the environment. The right amygdala is more strongly associated with negative emotions such as fear and sadness, whereas the left amygdala has been associated with both positive and negative emotional responses. The amygdala has an attentional role, focusing our attention on the most important stimuli in the environment. It helps us define a stimulus and primes our immediate response, for example in recognizing a dangerous stimulus and initiating a stress response. Processing social cues (e.g., evaluating faces) is also part of what the amygdala does prior to these cues being processed in higher cortical areas like the medial prefrontal cortex. Evaluating faces (e.g., the trustworthiness of a face) is an important social processing skill that is carried out very quickly in the limbic system. 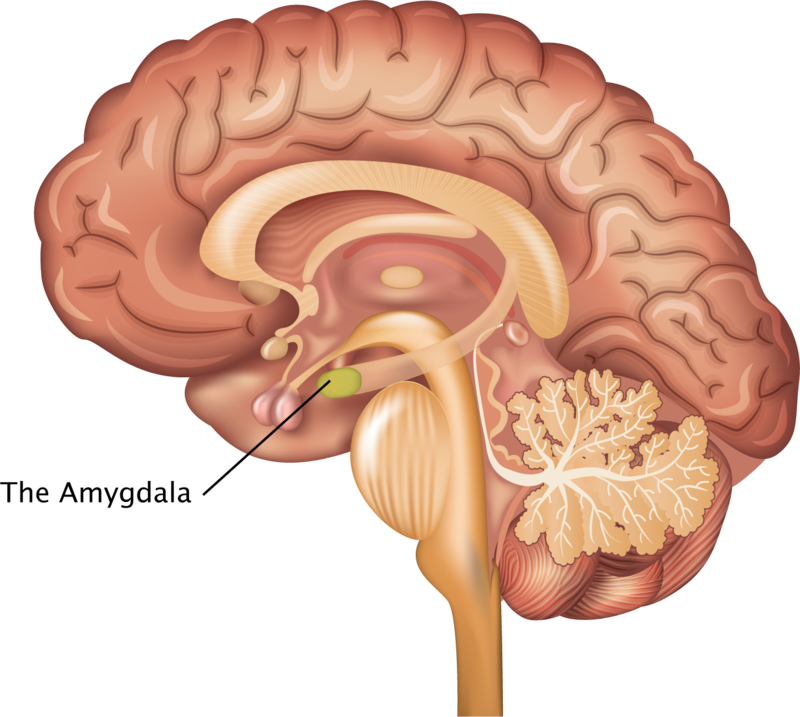 The amygdala also plays a part in processing reward learning and the resulting motivation, and modulating emotional states such as aggression, maternal instincts, and sexual and digestion behaviours as well as attention, perception, and explicit memory—generally thought to be part of processing the emotional significance of what we are encountering. Such processing causes the amygdala to respond with the release of hormones, or neuromodulators, that can alter the cognitive processing in cortical areas as well as activate the body for an appropriate response via the hypothalamus. In terms of information flow, sensory input goes to the thalamus and then directly to the amygdala (except olfaction, which goes directly to the amygdala), while it is sent also via a slower path to the neocortex. The amygdala is especially activated by surprising, ambiguous, and uncertain situations or stimuli. If the amygdala perceives a correspondence between the record of experiences in the hippocampus and incoming information, and judges that the stimulus warrants a fight, flight, or freeze response, then it will trigger the hypothalamic–pituitary–adrenal (HPA) axis and “hijack” the prefrontal cortex (PFC), partly in the form of blood flow being redirected from the PFC to the limbic system. This amygdala activity processes information milliseconds earlier than the neocortex, so in the case where implicit memory matches an incoming stimulus, the amygdala acts before any possible direction from the neocortex can be received. On the other hand, if the amygdala does not perceive a match to the incoming stimulus, it acts according to the directions received from the neocortex. This means that when the amygdala perceives a threat, it initiates a response to keep us safe from that threat, although this may not be the most adaptive response. We know a lot more about the fear response of the amygdala than its other functions, but there is likely much more going on in this structure than we yet realize. In the case of depression, the amygdala is often found to be enlarged from continual hyperactivation, with studies showing that there is an increased metabolic activity in the amygdala of depressed subjects. There is a positive correlation between the degree of amygdala activation and the severity of the depression. The depressive symptoms do not seem to dampen the anxiety-readiness for negative events or the ability to recall negative memories to ruminate upon.